Oh cookbooks...one of my greatest weaknesses in life..from the church paper printed ones to the fancy professional, I just love cookbooks. This one isn't any different. 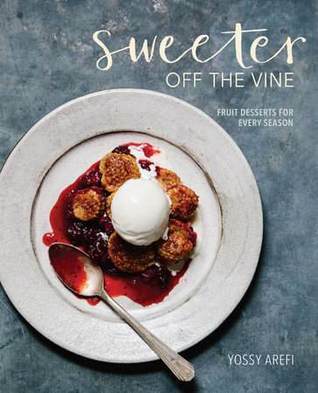 Divided into seasonal sections, the author has filled this book with fruit recipes that go from the most basic to some quite advanced. Since it appears that Spring is finally here and cherries are popping up in stores and at the market, I'm really looking forward to trying out those particular recipes. So, since we're talking recipes, let's break down the book a bit...The recipes are well written and easy to understand. If you have basic cooking knowledge, you'll be able to follow along easily and should end up with some scrumptious desserts. The photos are absolutely delicious and call me to go to the market, pick up some goodies and to bury myself in the kitchen for a weekend. Sadly, life keeps getting in the way of me having a baking marathon, but it will happen! If I had one complaint about this book it's that the pages are plain paper and in no way wipe-able. If you get something on this one...and you will, after all, you are baking...it isn't coming off. I'd suggest you get a sheet of plastic to put down over top so you can see the recipe, but still protect the book. After that, happy baking and enjoying the fruits of your labor!